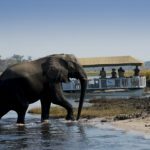 Famous for its spectacular inland delta, Botswana lies landlocked in the heart of Southern Africa amid Botswana, Namibia and Zimbabwe. The sparse population of this flat, peaceful land is doubly blessed with an exquisite subtropical wilderness surrounded by one of the most beautiful deserts on earth. Backed by a stable, democratic government, it is a true Eden in Africa. 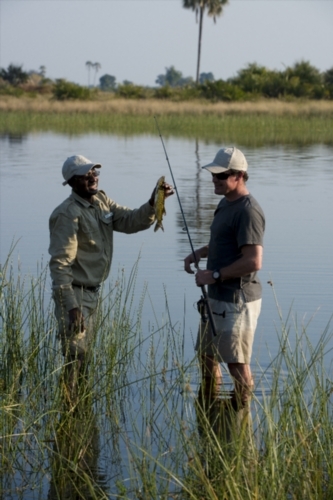 Botswana has remained focused on delivering the finest possible, authentic wildlife experience. 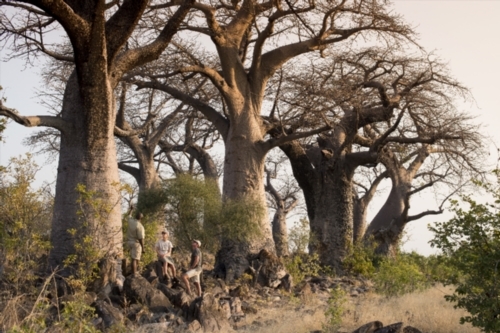 This is accomplished through one of Africa’s most sensible land plans ever devised. 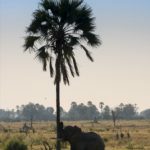 Much of Botswana’s best wildlife land is outside the parks! 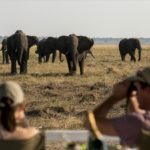 This land has been resurveyed over the past 10 years and has been divided into massive private reserves that are leased out to safari companies or to rural communities. 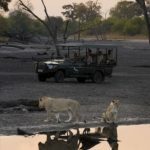 Well over 30% of Botswana has now been set aside for wildlife. The game lodges have to manage their operations within strict guidelines and with very strict carrying capacities to prevent overcrowding. 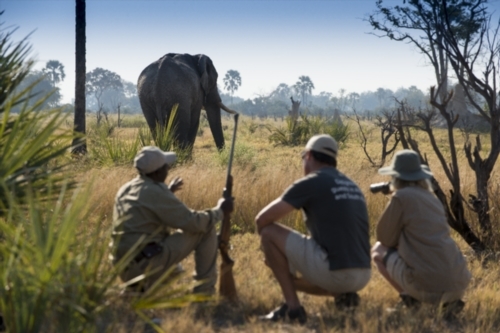 All visitors to Botswana are required to carry a passport that is valid for six months beyond the intended length of stay. There should be sufficient blank pages for entry stamps upon arrival. Where applicable, visas should be obtained from your nearest Botswana consulate. 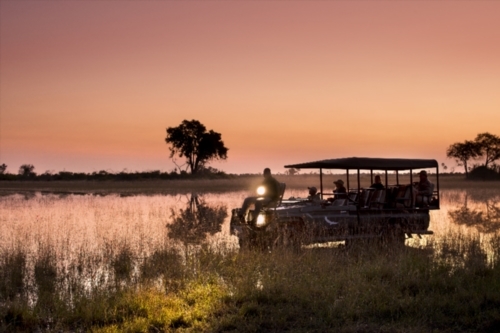 All visitors to Botswana may be requested to show proof of sufficient funds and onward travel/return ticket. 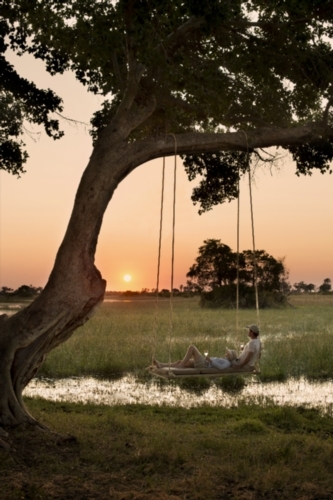 Summer in Botswana is generally hot and sunny in the morning with possible afternoon thunderstorms. Daytime temperatures can rise to 38ºC(100ºF) and night temperatures drop to around 20-25ºC(68-77ºF). The afternoons can be very humid. 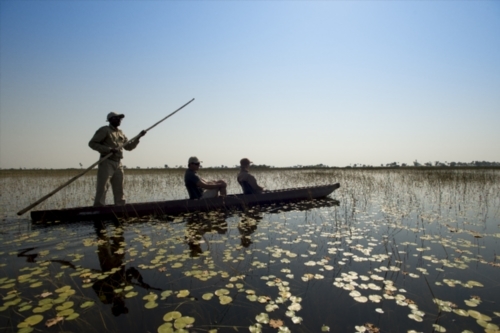 The rainy season in Botswana begins late in October/November and ends in March. The northern areas receive up to 700mm while the Kalahari Desert area averages as low as 225mm. During winter, days are dry, sunny and cool to warm while evening temperatures drop sharply. 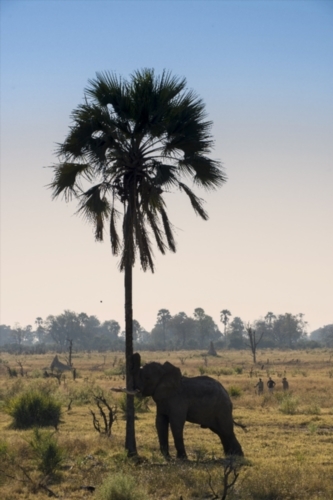 Daytime temperatures in Botswana generally reach 20ºC(68ºF) and can drop to as low as 5ºC(41ºF) at night. Please note that exceptionally cold spells can occur (although this is the exception rather than the rule), so it is recommended to bring appropriate clothing, just in case. Before entering Botswana, you will have to get malaria prophylactics. When buying them, tell your doctor or pharmacist that you intend visiting Botswana, as certain anti-malaria are tailored to particular areas. If you suffer from side effects, try taking your malaria prophylactics at night, after dinner. Take precautionary measures to prevent contact with mosquitoes, like: sleeping under a bed net or in a room/tent with mosquito proofing (remember to keep the flaps zipped at all times); spraying your accommodation with insecticide; making use of a mosquito-repelling lotion or stick and wearing long-sleeved clothing, long trousers and socks when outside at night. Any person entering Botswana from or via a yellow fever infected area must be in possession of a valid International Certificate of Vaccination against yellow fever. It is advisable to obtain medical insurance prior to arrival in Botswana. Health care standards in Botswana are high, with excellent hospitals in Gaborone and Francistown. All main towns have well-stocked pharmacies, but it is recommended that you bring any medicines you may require with you. 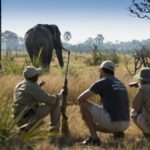 We strongly recommend that you take out travel insurance, which includes curtailment and cancellation cover, as well as medical cover, upon confirming your booking to Botswana. 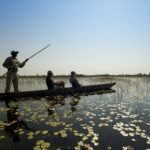 Best birding months in Botswana are November to March, when the Okavango Delta is brimming with migratory birds. 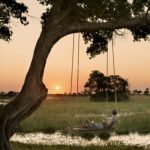 Best botanical months in Botswana are December to May, when the vegetation is lush and green, and also when most plants are in flower. 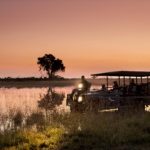 Botswana’s popularity as a destination is gaining in leaps and bounds to the extent that seasonal differences are not as marked as in previous years. Traditionally, however, peak season is from July to October and middle season is from May to June. Book well in advance. 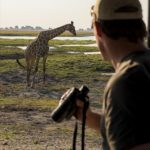 Very important: packing space is limited on all modes of safari transport so you will need to restrict your baggage to 20 kg / 44lbs (packed in a soft bag) including camera equipment. 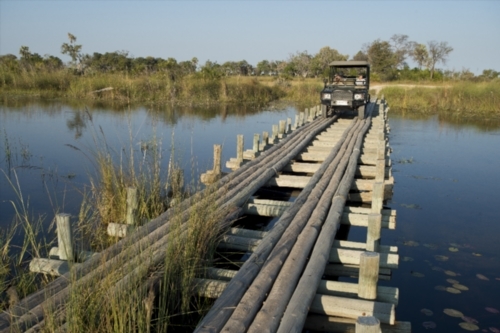 The largest reserve in Botswana, measuring 51 800km². 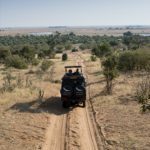 The Central Kalahari Game Reserve was created in 1961 and was set aside as a region where the San(Bushman) could live their traditional way of life. 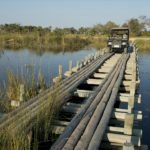 This reserve is only slightly smaller than Belgium and the Netherlands combined and it is not likely that you will come across the San whilst staying there. Roads are little more than tracks and there are no facilities of any kind. 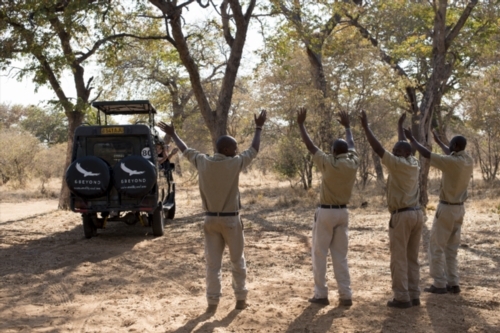 Only parties with the right equipment, vehicles and experience should contemplate a visit to this reserve. 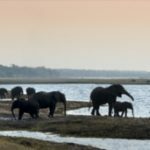 Home to the largest elephant herds in the world, the world renowned Chobe National Park measures 11 700km² and incorporates two principal wildlife areas: the riverfront and the Savute. 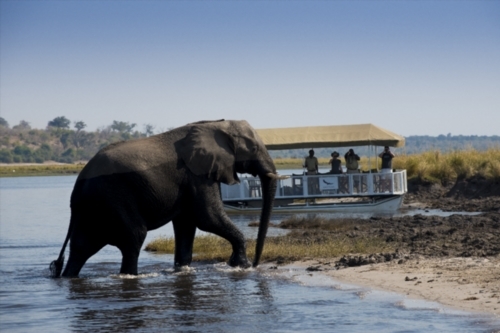 The riverfront stretches along the banks of the Chobe River from Kasane through Serondela to Ngoma Bridge. 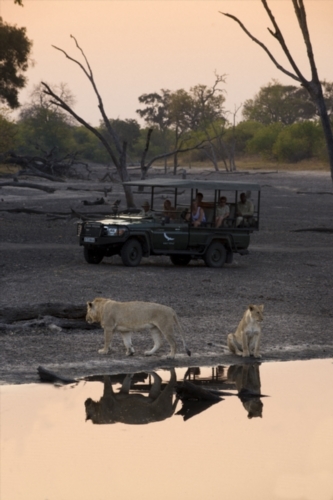 The river roads offer excellent game viewing and spectacular scenery. This region is also known for superb bird viewing, especially during the summer months. The Savute is the vast central body of the reserve, incorporating the Mababe Depression. The immensity of the depression is stunning, whether seen in the dry season, when it can appear almost desert-like and barren beyond belief, or after the rain on a crystal clear days across the vivid green of new grass. 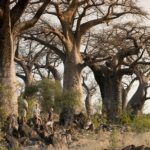 This pristine wilderness area of Botswana is reputed to be Africa’s most beautiful reserve. 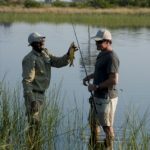 There are a wide range of habitats in Moremi – from the riparian woodlands, floodplains, reed beds and the permanent wetland of the Okavango Delta, through towering stands of Mopane forests to the dry savannah woodlands. Such a wide variety of habitats implies a wide variety of wildlife and at any time of the year, game is prolific (although what is seen obviously varies with the seasons). 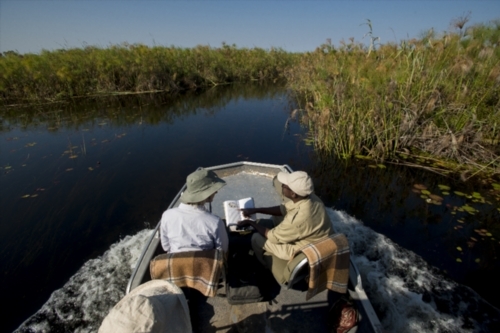 The mosaic of land and water comprising the Okavango Delta is a birder’s haven, especially from November to March when the area is brimming with migratory birds. 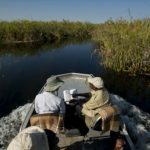 Other activities possible in this area are fishing, photography and guided nature walks on the islands of the Delta, which lie outside the boundaries of the reserve. 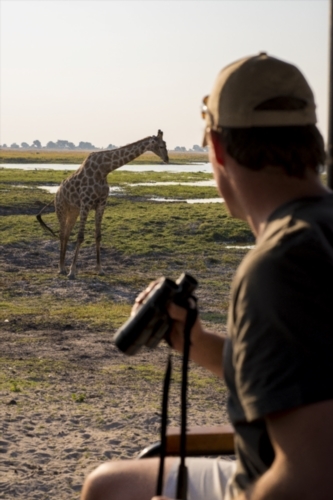 The great grass plains of Makgadikgadi and the associated pan complexes of Sowa, Ntwetwe and Nxai are scenically stunning – the first-time visitor is invariably struck by the wide vistas and the immensity of sky and horizon. Originally part of an ancient lake bed, the terrain is characteristically dotted with shallow depressions enclosing islands of stunted acacia trees. Here, you only have to camp on the crest of some forgotten dune, watch the shadows lengthen as the sun sinks, listen to the cry of the jackal as the shroud of darkness settles, to know that you have touched the soul of Africa. 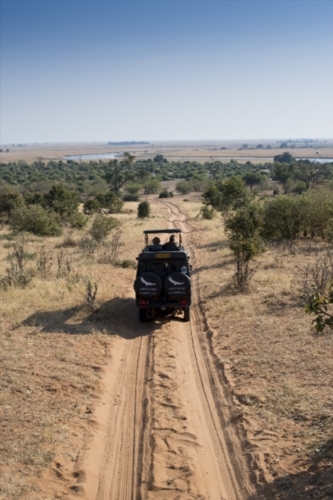 Take the beaten track or make your own way on a safari. Get closer to the wildlife than ever before. Go where the wild things are. 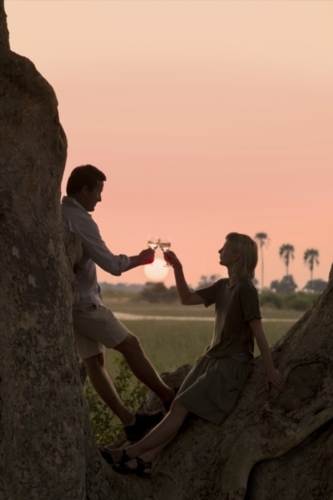 Safaris get you closer than ever before. 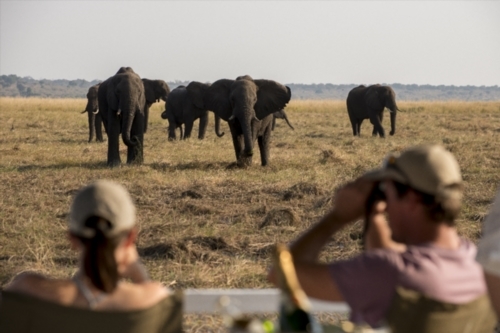 From the comfort of your veranda, watch the elephants live out their days. Farewells are short lived as many guests return for a repeat experience. Up close on a boat cruise. 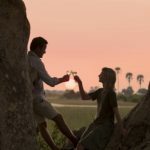 Sundowners experienced like never before. Usher in the evening with an unrivaled view. Exploring the land on foot, led by an expert guide. Fishing for tigers in the Delta. Seeing the Delta on a canoe.